To move into new space is the only way new realities can be created and the fastest way that new nervous systems can be activated. a) new space can occur as either "inner" or "external" space when regarding the body/mind complex as a division between the two. b) we enter new space frequently, every time we enter a room. It seems only a matter of becoming aware of this to create new realities and activate new nervous systems. c) spaces may appear as a sequential series of "chambers" when moving through them comparable to a voyage through various chambers described in Books of the Dead. We are here to go. d) we can use the crossing of a threshold into different chambers as a mnemonic for remembering ourselves or as a reminder to invoke presence. This helps enable awareness of new space. Numerous methods exist of entering new space apparently interior to the body/mind complex: meditation techniques, yoga, magick ritual, floatation tanks etc. Good art, theater, music, and literature also create new aesthetic spaces or chambers to explore and learn. It should be said that not every new space will create a new reality or activate a new nervous system useful to us. We don't indiscriminately wander about entering every new space available. We have the power of choice. Many of them aren't suitable or aligned with our life's aims. I'm going to look at the space created by music. Physicists and other noble theorists such as Buckminster Fuller postulate multiple dimensions inherent in the physical and metaphysical Universe. I postulate multiple dimensions in spaces made by music. I don't know what these higher dimensions consist of, or subscribe to any particular theory. I refer to these Unknown dimensions as "Macrodimensions" a catch-all term for spaces outside the 4 dimensions we know and agree about. It's a term borrowed from the American Book of the Dead. What I'm saying is that music can act as a doorway into the Unknown. To help get a clearer picture of how music creates a space we can apply the model I picked up from an article by Robert Fripp. This relates mostly to stereo recordings. The frequency range determines the height dimension, the panoramic (pan) position gives the width dimension, while depth corresponds to the dynamic range, how loud or soft any sound appears in the mix. Perhaps we could add rhythm as an indicator of the 4th dimension, time. Noting these parameters when listening to music can give a sense of the architecture of a musical environment. I should say that it's completely non-essential to know or remember these attributions to get the benefit of voyaging through musical spaces. They're given for musicians, producers, and engineers who are involved with the creation of these environments. In my experience, a great deal can be learned through exploring alternate spaces, musical or otherwise. Music, under the right conditions, alters mood. It may even exalt mood to such an extent as to allow the reception of gnosis. Gnosis refers to the direct perception of a Truth of one kind or another. The experience of gnosis goes way beyond learning something in a conventional way. It's the "aha" experience when all of a sudden you "get" it, whatever that "it" may be. I see the difference between gnosis and ordinary knowledge as the difference between knowing about something and experiencing its reality. In my early 20s I received gnosis once while doing a very basic beginner's magick ritual from a book called Between Heaven and Hell by Laura Huxley which involved listening to the live version of Midnight Rambler from The Rolling Stones album Get Your Ya Yas Out. It was during an instrumental section, actually the transition from one section to another. Somehow the interplay between Mick Taylor and Keith Richard's guitar parts triggered a deep understanding of Taoism, and the union of opposites which I intellectually knew about but hadn't fully experienced the truth of until that moment. This was entirely unexpected. I had set no specific intention for the experiment apart from going outside the boundaries of my ordinary reality. I'm sure many people can recall having a realization about something as a result of listening to music. Receiving gnosis, though very useful and informative, doesn't indicate absolute certainty about anything, in my book. At the start of Robert Anton Wilson's legendary online course on Aleister Crowley back in 2005, I wrote that I had a gnostic approach to agnosticism. The following week that phrase turned up as one the headers for the week's assignments. I don't know if Wilson drew inspiration by my comment or if, more likely, I was repeating something I learned from him. It could also have been a coincidence, I don't know that he even saw my comment. A brilliant essay on the relationship between gnosis and agnosis, or if you prefer, skepticism and truth is Crowley's The Soldier and the Hunchback. In that essay Crowley uses the word "samadhi" for what I'm calling gnosis and symbolizes it with !ie the soldier. Skepticism gets represented by ? This essay was one of the first things we studied in Wilson's Crowley 101 course. New realities brought about through listening to music aren't always or often earth shatteringly profound and enlightening but can still impart useful, even life altering information. Another example: At one point in my life I swore that I'd never become a recording enginner. that I would only mix live sound. This was a result of observing the band that employed me at the time, The Tickets, working with a hot shot producer who turned their basic rock-n-roll sound into a slick syrupy pop confection that sounded nothing like them. One night after a gig I put on Brian Eno and David Byrne's My Life in the Bush of Ghosts which had recently come out. It was the first time I'd heard it and it really transported me somewhere else. Afterwards I realized that some spaces could only get created through the technology of recording. They could not be created through live performance. Another example of this, which most people know, is the highly experimental sound collage Revolution #9 that John Lennon and Yoko Ono put together on The Beatles White Album. It was as a result of entering the space created by My Life in the Bush of Ghosts that I made the decision to become a recording engineer. Moving into that space eventually created a whole new reality (and career) for me, and, I would say, activated a new nervous system. Note: the process of activating new nervous systems is also known as Alchemy. Gurdjieff called it "coating higher bodies." I realize this material maybe not for everyone. Thank God I'm not trying to start a religion, philosophical movement, or political campaign. A recent post at RAWIllumination.net linked to a very interesting comment made by Timothy Leary at the Nova Convention in 1978 that I'd like to examine, especially in relation to music. The Nova Convention was organized to present the works and interests of William S. Burroughs and various other writers, artists, musicians, philosophers, poets, and visionaries that had been inspired by him. It served up a counter-cultural all-star game with Frank Zappa, Robert Fripp, Brion Gysin, Robert Anton Wilson, Timothy Leary, John Giorno, Allen Ginsberg, Blondie, Patti Smith, Laurie Anderson, Anne Waldeman, Phillip Glass, and others. To give some perspective: The Convention began November 30, 1978. November 18, 1978 is when Jim Jones allegedly convinced his followers to commit mass suicide by drinking cyanide after some of them attacked and killed a U.S. Congressman and 6 of his party who had been investigating the cult. Apparently, at about the same time, William Burroughs had been given an assignment by a major magazine to write a piece on the Jonestown cult. The story I heard, and it may be apochryphal I haven't found a source for it on the web, says that Burroughs was enroute to Jonestown when the suicide went down so that when he arrived he only saw the aftermath. Robert Anton Wilson had written about a mass suicide with cyanide as a satire on brainwashing in Illuminatus! a few years earlier. My point in bringing this up is to show that human insanity, stupidity, confusion and chaos created just as much of an emergency condition then as it does now. Burroughs and other participants of the Nova Convention were right in the thick of it and were offering up and suggesting solutions. Q. What is the Nova Convention about? Burroughs: This is the Space Age and we are here to go. Leary's comment that I want to discuss comes from a recording of a panel discussion found by going through the last link, #16, on this page. It's from the album, The Nova Convention by Giorno Poetry Systems. It becomes obvious from Leary's next statement that he is NOT talking about a new space created by LSD or other drugs. It also seems clear with this brief panel discussion sample that moving into new space includes more than transporting our biological containers off Earth. So what does it means to move into new space and how might that create new realities? Another comment from the panel points out that no distinction of inner or outer space gets made implying that Leary's statement applies to both. I consider the distinction between inner and outer a convenient, but ultimately false dichotomy. At the time of the Nova Convention there existed high hopes that the human race would migrate off the planet in the near future. Leary waxes poetically in places of the accelerated personal evolution that could occur in a zero-G environment. At present time, it doesn't seem likely that an ordinary person in my generation will experience any kind of off-planet environment to work in. For the time being, we can rule out space travel as a practical means of creating new realities and activating new nervous systems for all but a very few. However, if we observe closely, it will be seen that we constantly move into new space all the time. Every time we enter a room or an outdoor environment we move into new space. Even a familiar location that we've been to many times before will appear as a new space because every time we enter it we are slightly different than the time before. The Tibetan and American Books of the Dead highlight this by mapping out a series of sequential chambers the voyager passes through. Similarly we may view each room or location we pass through in daily life as one in a series of "chambers." As in the Bardo, it can be observed that each chamber affects our consciousness, our perception of reality. Thus, a new reality can potentially be created simply by paying close enough attention to our inner and outer environment. This kind of attention directed both outwardly and inwardly at the same time is what G.I. Gurdjieff called remembering yourself. In Beelzebub's Tales To His Grandson Gurdjieff alludes to the idea of new space = new reality by indicating that the architecture of a building affects consciousness. Anyone can verify this for themself by going into a beautiful church or cathedral. 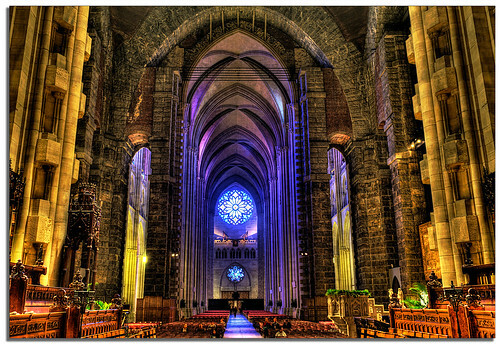 I submit that even the staunchest, most determined atheist would feel their mood uplifted simply by entering St. John the Divine Cathedral in Harlem though they might think it all based on nonsense. To help facilitate this kind of remembering you can do an exercise to wake up somehow ( whatever that means to you) or invoke presence every time you cross the threshold into a new space. An elaboration of this appears in E.J. Gold's Practical Work On Self chapter 15 called Doorways. You'll also find there an explanation related to the activation of new nervous systems through this exercise. I'll leave it at there for now and get into music and new space next time. Times Square Hotel, New York, summer of 1982. This was my first time in the Big Apple. I was on vacation from the band I toured with, The Tickets, who were based out of Calgary, Alberta in Canada. I'd just finished spending a week with my Grandparents for the last time, and other relatives in Cleveland where I was born and lived until age 9. Doug Kuss, the lead singer for The Tickets had convinced me to check out New York saying that I'd really appreciate it. He and his girlfriend Candy went every year. It was Doug who suggested the Times Square Hotel as being right in the middle of things. Located on 43rd Street between 7th and 8th Avenues it was ideally situated for someone taking the initial plunge into the maelstrom of New York culture. After checking in, I called the Front Desk and asked to connect to Mr. Kuss' room. "I'm sorry, we don't have anyone with that name staying here." Doug and Candy were supposed to have arrived a few days earlier. They were going to be my guides. Something must have happened. Turns out they stopped Doug at the border and refused him entry for an old marijuana possession conviction. I was on my own. First thing I did was go out and walk and walk and walk. The place was just buzzing with Life like nothing I'd ever seen before. Forty-Second Street was years away from being Disneyfied. It still had all the color and character from the days when the Beats used to hang out there. Thousands of mini-life dramas concurrently playing out amid the bustling hustle of urban survival. Years later I recorded the song/poem Forty-Deuce Street by Umar Bin Hassan that captured the energy found there. One priority was getting books that I couldn't find in Canada. At that time Weiser's, a leading occult and esoteric book publisher, had a storefront bookshop on lower Broadway only a few blocks away from the recording studio I ended up working at. I stocked up on Crowley and Gurdjieff related titles. The theater I saw on that trip consisted of Woman of the Year starring a very talented (I was surprised!) Raquel Welch in one of the more enjoyable Broadway plays that I've seen. Oh Calcutta I went to because one of its pieces was by John Lennon. It was ok, not memorably great. Music I heard included a concert by Blondie warmed up by David Johansen (ex-lead singer of the New York Dolls), Nico ( formerly of the Velvet Underground), and English punk icons Killing Joke whose music seemed fueled by Thelemic metaphysics. What topped all of them was seeing Sun Ra and a special edition of his Arkestra that had over one hundred musicians and dancers at a small cabaret in the East Village. It remains as one of the most powerful performances I've ever seen, and I've seen and mixed quite a few powerful music performances. Doug had told me about these "cats" who sold loose joints on the street for a dollar a joint. In 1982 smoking pot was one preferred method of relaxation second only to yoga so I attempted to avail myself of these gentlepeople's wares. Unfortunately, most of their product didn't work at all. Finally, on my third attempt, I found some weed that had a mild effect, but noticeably different from any cannabis high in the past. I attributed this to being at the altitude of sea level in New York, thousands of feet lower than the foothills of the Canadian Rockies that Calgary was close too. I was extremely naive (and still am to a greater or lesser degree) if that's not obvious already. So one afternoon I decided to go see a film advertised as avant garde called Ciao Manhattan. The only thing I knew about this film was that it had something to do with Andy Warhol and his crowd. Found out later that it was the life story of Edie Sedgwick a notorious model and socialite who became one of Andy Warhol's Superstars but then degenerated into drug abuse, mental instability and a early death. She had also served as an important muse for Bob Dylan. The song Just Like A Woman is about her and she reputedly inspired other Dylan songs. One of the things I loved about New York was that you could calmly smoke a joint outside on the street or in a park without worrying about arrest or imprisonment. I took advantage of this freedom just before entering the movie theater to smoke about half a joint. Suddenly, while standing in line in the lobby I felt this tremendous wave of energy that shot my awareness out the top of my head and continued vertically through the roof of the theater building. For a split second or so I had a rooftop view of lower Manhattan before my awareness returned to the body. Being back in my body was nice only I felt very, very stoned. This startled me so much that I felt I had to leave the theater so I went to the park across the street to take stock of the situation. It felt like I'd been dosed with strong acid. Found out later that it most likely was PCP which street hustlers would use to spike their fake marijuana. I'd inadvertently taken a significant sample. Not having anything else planned or being in a frame of mind to chart a new course for the afternoon, I thought I could handle watching the film so I went back in. Again, I had no idea what it was about. Fortunately for me I'd had just enough yogic training to remember to focus my attention by breathing deeply and slowly. Hallucinatory critters and wildly dancing chaotic forms appeared uncomfortably at the periphery of my awareness, but the breathing maintained calm enough to watch the film. The Void was at my back, or so it seemed. I was very conscious of the irony of watching the true story of someone completely destroying themselves with excessive and indiscriminate drug abuse while feeling stoned on the edge of reality. My life imitating her life presented as art. I could not help but register a lesson in life going down here. That evening I planned to see a Todd Rundgren concert at a pier on the Hudson river just off of 45th street. This venue was a great place to see mid-level touring acts in the early 80's. I don't recall the name of the venue, I always referred to it as the 45th Street pier. It held about 2000 concert goers, and had an excellent sound system which they weren't afraid to turn up. It always felt peaceful and safe there even with a noisy congregation in attendance perhaps due to the surrounding water and the river breeze that kept things a little cooler than the rest of Manhattan. The USS Intrepid, a WWII era aircraft carrier was permanently parked right beside the pier. It had been turned into a naval museum. I don't know why I chose to see Todd Rundgren that evening. I had planned it in advance of the unexpected mind alteration fate had chosen to serve me. I wasn't a big fan of his music but respected him as a recording studio genius and innovator. He was also at the forefront of exploring new audio technology, and seemed to have knowledge and conversation with more esoteric levels of consciousness. The concert showcased his most recent album called Healing. After the film I felt less edgy, probably from all the deep breathing I'd done, but still unsettled by all the tragic impressions I'd absorbed. I hoped the concert would pick me up, and it did. Rundgren's new music sounded more cerebral than my usual fare and much more synth laden than I preferred yet I had the sense that something different was going on here so I tried to take it all in without judgment. Even though I didn't fully grok the music I did feel much better after the show, in fact, although still in a distinctly altered state, I'd never felt better. Whether it was the side effects of the chemical ingestion combined with the Healing music tempered by an active imagination, or something else, I don't know, but I'd regained a sense of being connected to the Invisible College of Adepts, who, if they exist, are said to guide the course of planetary evolution. Although I didn't have the language for it at the time, it felt very much like what I've come to know as a bardo space as I joined the flow of the concert attendees making their way home. A few blocks east of the river I spotted a large eye in the triangle image on a Todd Rundgren concert t-shirt. The eye in the triangle symbolism was extremely important to me at that time (and still is) because I'd recently had my cosmic trigger pulled. That is, I was still caught up in the throes and glow of having read Robert Anton Wilson's Cosmic Trigger for the first time, a book that radically transformed my life. 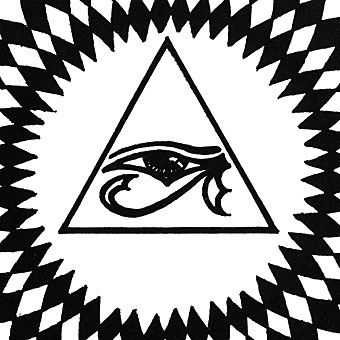 Wilson used the eye in the triangle symbol throughout Cosmic Trigger to indicate a new subject or a new line of inquiry in the book. The Eye in the Triangle was also the title of the only accurate biography of Aleister Crowley circa 1982, a book I'd recently read and had been enthralled with. The eye in that symbol represents the eye of Horus. The Egyptian solar god Horus is the reigning deity of the new magickal formula given to humanity, as Crowley presented it. So, I just had to get me one those t-shirts. Back on the concert grounds, all the vendor's tables were still in service but no one had what I was looking for. I couldn't figure this out. Then it suddenly dawned upon me, like a crystalline iceberg in the fog of my mind, that I had seen a shirt from an old tour. A little disconcerted, I ended up purchasing the current tour t-shirt which had the word Healer in blue lettering on the front and some strange, geometric looking graphic silk screened on the back. Healer is the title of the first song from Rundgren's Healing album. I didn't think much of the shirt and likely only picked it up out of embarrassment for having been conned (or so I thought) into an eye in the triangle treasure hunt. Back home in Canada I showed the shirt to my friend and roomate, Bob Gregory, who played the role of wise older mentor to me in that segment of this life's drama. Bob was the one who had turned me on to Crowley and The Cosmic Trigger and various other titles in his fabulous esoteric library. I wasn't aware of it then, but Bob was an informal Qabalist who never tired of reminding me that "Bob" spelled backwards was still Bob. I made sure to point out to Bob the strange diagram on the back of the shirt that intrigued me in a curious way. After he saw it Bob immediately said, "Oh that's a Tree of Life," as if I was expected to know what that meant. Addressing my puzzled expression he continued, " It has to do with Qabalah, you know about Qabalah, right?" "No, not really" even though I must have read some mention of it in Cosmic Trigger along with a thousand other highly interesting new subjects. "Well the Qabalah explains and classifies everything" was Bob's succinct explanation of this vast subject. Bob pondered for a second. . . "yeah, everything." I left it at that. That I'd picked up a Tree of Life at a concert after a remarkable day in New York meant absolutely nothing to me at that time. It didn't even look like a standard Tree of Life diagram. This was a more collapsed 3 D rendering of it but still very recognizable if you knew what to recognize. A year later I was actively developing my own Tree in the inner temple of my work starting from the central sphere of Tiphareth and expanding out. Todd Rundgren indirectly influenced my musical trajectory in other ways. An early audio mentor was Engineer/Producer Tom Edmonds. Tom had "grown up" ( an expression indicating picking up your studio chops) assisting Rundgren up at Bearsville Studio in Woodstock, New York. Bearsville was the studio that uber manager Albert Grossman had built to service his clients which included Bob Dylan. Grossman also managed Rundgren. The most well known and best selling record that Tom worked on with Rundgren was Meat Loaf's Bat Out of Hell. The album I began working on with Tom was Meat Loaf Live at Wembley which featured some righteously rocking versions of some of those classic songs. I did run across Todd Rundgren again about 5 years ago at the Burbank Airport. He was seated on some steps across the way from where we were walking. I inadvertantly blurted out, 'hey there's Todd Rundgren' to my friends. He heard me and we made eye contact. Two new cds getting lots of play at The Oz Mix headquarters are Rise Again by Lee Scratch Perry, and surprisingly, the recent tribute to the songs of Buddy Holly called Rave On. I'll talk about Rise Again soon, in a future post, but first I have to rave on about Rave On. I wasn't expecting to like this album as much as I do. Outstanding soulful performances, interesting new arrangements sometimes very different than the original, and best of all, excellent, often out-of-the-box audio production. The highlight for me has to be Paul McCartney's two versions of It's So Easy. One version sounds like a raucous garage band reinventing the passion of rocking out for the first time, vitally fresh and alive. The production is exquisitely raw and down to earth - a tastefully distorted lead vocal compels McCartney's powerful delivery that gives the feeling of someone pulling out all the stops to communicate their truth. The gorgeously over-compressed drum sound squishily keeps a smoothly rolling rhythmic chug with cymbal splashes sustaining forever. This drum sound makes a big contribution to the contemporary/retro atmosphere of the track. I once joked about writing an academic paper on the different types, uses and abuses of compression in audio mixing. Over-compression can choke a sound much easier than it can create an interesting new texture. It's a fine and delicate art getting interesting sounds with extreme compression. The It's So Easy drum sound would be one model example if I get around to writing that paper. If I had to guess, I'd say they used vintage API 525 compressors which can do magick things to a drum beat. This track, produced and engineered by David Kahne, was recorded at Avatar in New York. Avatar used to be the Power Station, and still sounds like one of the top studios in the world. Rave On, in particular the garage version of It's So Easy makes a great soundtrack to everything I've been writing about Qabalah. Recently I saw a documentary on comedian Bill Hicks, someone largely off my radar until now. There was one clip where Hicks bemoaned the state of music and expressed, in a very catharic fashion, the kind of music he'd prefer to hear. I wish he was still alive to hear Rave On because it fully meets his criteria. I found the same clip on YouTube. Warning: it's quite intense. I completely disagree with the Amy Winehouse spin imposed on it. I don't believe Hicks was being literal when calling for death. When he rants: "I want them to play with one hand, and the other on a gun (pointing to his head) ..., " it gives a graphic variation on Crowley's instruction to "Slay mind" from the Lambskin poem a few posts back. A number of other tracks from Rave On exude the same kind of passion but with a more elegant aesthetic. Patti Smith's version of Words of Love is another favorite from this collection. Critic David Fricke from Rolling Stone called it a 'precious wish.' Fiona Apple and Jon Brion do a superbly intimate version of Everyday. Florence + the Machine play a unique version of Not Fade Away that evokes the mood of a New Orleans street band on a joyful funeral march. All of the tracks are well done and worth listening to. This recording highlights the brilliance of Buddy Holly's songwriting, something I didn't fully appreciate until now. Sometimes you'll hear the 'selective perception' objection made against the active qabalist. Selective perception, in this context, means that certain numbers appear more because you're either subconsciously looking for them, or you're selectively choosing to perceive those numbers while ignoring others. You see your key numbers more only because you have given them special significance. They stand out more but don't really occur more than any other number randomly would, according to this argument. The point is valid to some degree. Self deception is easy, and we make up meaning and significance all the time. I can recall two films where the protagonists had a severe form of this which lead to obsession, A Beautiful Mind, the Russell Crowe film based on a true story, and π or Pi. This only affirms Qabalah as a powerful and effective tool for altering consciousness. The fact that tools can get abused doesn't mean that the tool is imaginary or universally harmful and can't be utilized with intelligence and common sense. Non-judgmental self-observation is one preventative remedy against psychological imbalance. Certain numbers may take on extraordinary significance to you as a result of mind-blowing synchronicities ( meaningful coincidences), to use a technical term. If a number comes to your attention through one or more startling coincidences and you don't take notice, then you appear to be either uninterested in learning more about yourself and the Universe through Qabalah or are just generally occluded to accept the possibility of anything outside what you've been told is real. There's a line from the film, Beetlejuice, that goes something like, "the living won't see the dead, not can't, but won't." Understood metaphorically, this could mean that "the living" - those who have never undergone or don't remember any kind of ego death, the unwashed masses as it were, won't see "the dead" ie the Bardo, the magickal world where change occurs. Not can't, but won't. By the way, Beetlejuice, contains multiple levels of qabalistic symbolism. It's considered a textbook study for bardo information and functioning whether seen through the macroscope of qabalah or not. However, this is all beside the point I've been making, that Qabalah is a higher order language useful for transformation. The proof of this is in the writings of authors who use Qabalah, as well as the fact that this language has dictionaries for it. It's not necessary to receive numbers through strange circumstances to observe that some numbers have been given prominent attention. Perhaps the most well known of these in this cultural enclave is the "23 Conspiracy" presented in Robert Anton Wilson's Cosmic Trigger Volume I which he first heard from William Burroughs. Anyone who believes that Wilson was merely sounding off on an obsession he selectively afflicted himself with is missing a valuable lesson. 23 does have a connection with a particular archetype quite discernible by looking it up in 777 (don't forget to check the list of primes) or by reading Cosmic Trigger. Anyone care to say what I'm getting at? Earlier I made the argument that Wilson also highlighted the number 68, though he did so mainly in a qabalistic fashion, not directly like he did with 23, except for the direct mention of 68 on the first page of Illuminatus! 68 is the second number given in Illluminatus! right behind the number 1. This makes sense because the first chapter is called The First Trip, or Kether which is the first Sephiroth on the Tree of Life. I forgot to mention another strong allusion Wilson made to the ideogram represented by 68. Shortly before he died Wilson wrote his last public statement on a blog and signed off with the whimsical instruction to "keep the lasagna flying." Now if this flying lasagna is as good as my father's homemade recipe or any other genuine Italian cook, it's not much of a stretch to consider it heavenly food. Heavenly food is also known as manna. Manna is the title of chapter 68 from Crowley's Book of Lies, a qabalistic touchstone. Was Wilson communicating something along the lines of summing up his life's work and the continuation of it, or was he being merely whimsical? Perhaps it was a Discordian attempt to promote harmless anarchy, or maybe he meant to support the lasagna economy with increased sales? Could it be some combination of all of these or for a whole other unknown reason. Any thoughts? To clarify something in the previous post - when I said it was easy to temporarily get out of limiting belief systems, I meant it seems easy to temporarily quiet the ego and habitual mind enough for the purpose of getting on with the experiment. In general, it doesn't seem easy at all to change deeply ingrained programming and strongly held belief systems about who we are and what we can do, but it is possible, even probable when one actively embarks upon the course. One method I'd like to present is Beliefs Unlimited, a meta-programming (programming your programs) technique designed by Dr. John Lilly, one of the greatest visionary scientists of the XXth Century. Lilly was a pioneer in the research of dolphin intelligence, and was the inventor of the floatation tank. five times into a tape recorder. experimentally. These limits are beliefs to be transcended. establishes an open-ended set of beliefs about the unknown. I quoted the first couple of paragraphs because it seems to sum up the situation. The whole exercise is highly recommended by me. A free pdf can be downloaded HERE. It's very short, only 10 paragraphs, and like it says, is meant to be recorded 5 times. The instructions before the start of the tape and below can be modified as desired. I made one recording where the effects - flange, delays and reverb - got progressively stronger with each cycle. (from The centre of the cyclone an autobiography of inner space by John C.
I tried it maybe a dozen to 20 times in various modes of "imprint vulnerability" - greatly aided by a floatation tank. Not that I couldn't benefit from doing it more. I probably will. Note that when Lilly writes, "To transcend one's limiting set, one establishes an open-ended set of beliefs about the unknown," he doesn't give any indication of what those open-ended beliefs should be. That's all up to you. I also find it significant that he suggests a "set of beliefs" rather than "a belief" about the unknown. I remember Lee Perry, of the Samadhi Tank Company, telling me that John told them when giving orientations to first time users of the floatation tank to take extreme care to NOT give them any kind of programming or suggestions about HOW to use the tank, what to do or expect in there. It ends the way it started, and starts the way it ends. Skidoo = Get Out = a banishing. Starting with a banishing and closing with another banishing follows the same form as a magical ritual or service. In magick, the first banishing is meant to clear and cleanse the space of any inner or outer distractions so that the focus can be on the intention of the operation. The final banishing is actually meant to banish the space of the ritual, to return to common place, everyday, knock on wood reality. This is why it's really rather easy to Get Out of personality, ego, and limiting belief systems because you know that it's only for a set period of time, and for a specific purpose. You also know that a very necessary part of closing the Experiment will be to banish that Alternate Reality and return to (take rebirth in) the comfort zone of material reality - what Qabalists call Malkuth - perhaps a little wiser for the experience. Musicians who are making music, not generating sound vibration cliche, do this all the time when they play. They instinctively understand that it's ok to take their music where it wants to go because it's only for an agreed upon period of time. The second banishing makes it ok for skeptics to temporarily drop their skepticism if they wish for a taste of gnosis themselves instead of remaining only skeptical of it. Gnosis doesn't establish certainty but it does make a convincing case against absolute skepticism of anything outside what we already know about the so-called laws of nature. Balanced skepticism appears invaluable and essential for keeping one psychologically centered and grounded. Robert Anton Wilson's Cosmic Trigger Volume I is the best example I know of in print of someone with this kind of critical skepticism balanced against great flexibility with temporarily dropping skepticism for gnostic experiments. The Book of Lies is one of AC's more interesting books, but fairly obscure to me. I suppose the first line means, 'Get lost, uninitiated!' or something along those lines. I can't find 'Tyle' but the word 'Tyler' is the outer guard of a masonic lodge, but that may not be relevant. Thank-you for this valuable research, LJ. It highlights a point previously unknown to me in that poem, but very related to what I've been getting at - that anyone can do the "work" that's been suggested in the past few posts from (to borrow a memorable phrase from William Burroughs and Robert Anton Wilson) 'right where you are sitting now.' Meaning that no special training is required. No particular ideology needs to be subscribed to or believed in. Nothing to buy or sign up for. You don't have to wait until you're ready. This applies to everything that's been presented here about the technology of bardo readings - what Tibetans call the Power of Liberation by Sound - from doing a formal reading from the American Book of the Dead to singing a song for someone. From reciting the opening page of Finnegans Wake to inspire and invigorate a drum solo recording ( I saw a drummer named Skip Reed do this at a session for The Laughing Dogs - he recited it from memory) to listening to the Bill Laswell/Tony Williams collaboration, ARCANA: Arc of the Testimony with expansively directed attention. My interpretation of Cowan leans more to the first definition LJ provided above: 'One who does the work of a mason but hasn't been apprenticed to the trade. ' The other definitions apply as well because we have multiple meanings here. Skidoo is the title of chapter 23 from The Book of Lies. The formula there is, Get OUT. Therefore the first line could read as: "Uninitiated, or beginner, get OUT! Two meanings, opposite to each other, suggest themselves. The obvious one - a literal warning to be taken seriously, and the one Crowley gives as a magical formula which, on the most basic level, means to transcend your fundamental preconceptions about what is real and what is possible. Or to just simply get out of personality, get out of ego as a precursor for entering the temple. That's all the uninitiated need do to begin. By the way, this is but the tip of the iceberg to this formula/banishing, get out, as further study and practice will certainly reveal. - The Officer in charge on the further side of the Lodge-door. When he and the Officer on the hither side are on active service the Lodge is tyled. He is called Janitor in the Royal Arch and Guard or Sentinel in some other Degrees. THE BOOK OF LIES is a witty, instructive, and admirable collection of paradoxes; however, it is not a philosophical or mystical treatise. Actually, its subtleties exhilarate. Scholars have said it is "stupendously idiotic and amazingly clever." To endeavor to translate it into definite terms Crowley's aphorisms would detract from the value of the book. It is wiser for readers to make their own interpretation. Toshinori Kondo is one of the world's top players of the electric trumpet. I've had the great fortune of knowing and working with him since about 1991 when I went to Japan with Bill Laswell to mix the Front of House at the festival Kondo organized in his hometown, Imabari. We also recorded an improvised album at Kondo's studio, Metal Box, on the same trip called, The Map Is Not the Territory. It features an incredible line-up of musicians. Along with Kondo and Laswell it includes Ginger Baker, Anton Fier, Yamaki, Foday Musa Suso, Akira Sakata, and Peter Brotzmann among others. This collective became known as Autonomous Zone a name derived from Hakim Bey's radical manifesto, Temporary Autonomous Zone. Kondo began his Blow The Earth project playing solo against the backdrop of Israel's Negev Desert in 1993. I wanted to improvise with the vibration of Great Nature. The four seasons of Japanese nature seems like the breathing of Earth. Most of the performances on Blow The Earth Japan are solo offerings outdoors in majestic and beautiful settings. The cinematography is crisp and alive, effectively capturing the grandiose scope of Kondo's vision. The various environments read like a visual musical accompaniment to the electric trumpet phrases and progressions often awash in a halo of atmospheric effects but sometimes sounding just the pure tonality of the horn. The Winter portion has Kondo playing at the Kamigamo Shinto Shrine in Kyoto. Here he improvises with chanting priests. Kondo also introduces Professor Naiko Tosa, a visual artist who researches interactive media art at Kyoto University. She and I would attempt to express the presences of the Gods through visuals and music. This demonstrates the invocational nature of Kondo's music which becomes obvious when you hear it. Tosa adds, The ancient figures and the lightning will move with Kondo's trumpet sound. This is the aim of my interactive art. Kondo mentions that the god of this shrine is Thunder which is fire. But thunder brings rain so it is a god of water, also. So no one was surprised when it began to softly rain during the set-up for the show and the performance. The sound of the rain contributed gentle background polyrhythms to the composition. Spring sees Kondo and his electronics perched atop a small rock overlooking Kurushima Straits, the entrance to the Inland Sea, an area he played in as a child. He also plays at Koriyuji Temple on Oshima Island, the family temple of the Murakami pirates. The performance opens with a group of Buddhists chanting an ancient poem of pilgrimage before Kondo improvises on the horn with traditional taiko drummers. For Summer Kondo travels north to Iheya, a small island near Okinawa to play during a solar eclipse on the beach just outside the entrance to a huge cave considered to be sacred. A crowd of about 300 gathers with protective eye filters to witness the solar eclipse while Kondo plays in front of an entrance to the Underworld. Autumn finds Kondo playing on top of Mount Aso in central Japan. He was hoping that a local phenomena of climate known as the Sea of Clouds would occur. It manifests as a continuous blanket of white cloud cover just below the summit of the mountain so that it appears as a sea of clouds from the mountain top. Told by a local that it's extremely unlikely that the Sea of Clouds would happen in the next few days, Kondo says that it's no problem, he will camp out on the mountain until it does. The next morning the Sea of Clouds rolls out in fine form apparently not wanting to be late for the curtain call. Kondo takes Shakespeare literally when he says, "All the world is a stage." Apart from his other music projects, Kondo is a member of the Bill Laswell organized collective, Method of Defiance. Cowan and Tyle are terms from Freemasonry with meanings I know not. Skidoo alludes to ch. 23 of the same book, a key chapter related to what has been presented here.